This page will provide you with information about glaucoma surgery. For further details, please speak to your consultant. 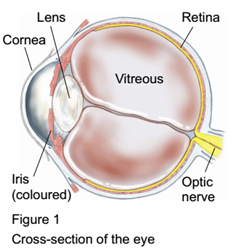 Visual information is sent from the retina to the brain via the optic nerve (see Figure 1). Glaucoma is a term given to varying conditions which cause the optic nerve to become damaged, commonly as a result of too much pressure in the eye where fluid has not properly drained. Yet, even if pressure levels are considered normal, it is still possible for the optic nerve to be damaged. On average, 1 in every 50 people over 40 years of age will contract glaucoma, and may find their sight significantly impacted by the condition. Glaucoma surgery aims to restore vision and acts as a preventative measure for further damage to the optic nerve. What are the alternatives to glaucoma surgery? Eye drops are often used to lower the pressure within the eye. Laser surgery may also be offered to you, though surgery is considered to be the most effective option. Your doctor will make a small incision within the eye to allow the excess fluid to drain. Local or general anaesthetic may be offered, and the procedure can take anywhere from 45 to 75 minutes. You should be well enough to go home within a few hours of the procedure; however, most patients will rest for around two weeks before returning to work. In the weeks following surgery your consultant will need to check the progress of your recovery, and they may need to carry out minor amendments. It is important that you do not try to lift anything heavy during your recovery or go swimming. In addition, you should refrain from doing any bending where your head is lower than your waist. Regular exercise is recommended for ensuring good overall health, but make sure you speak to your consultant. Glaucoma is caused by damage to the optic nerve and can negatively impact your vision. Surgery helps to restore vision and prevent further damage.